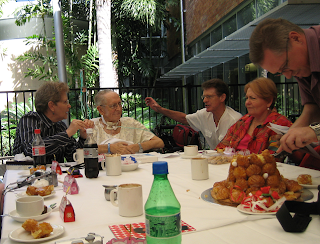 Doonan diddly-squat: The seven stages of caregiving? I confess I have not lived up to my purpose in starting this blog – which was, 'to reflect about living with, caring for and being cared for in turn by a home, a garden and a partner with primary progressive aphasia. I have published many posts about the home and garden. But 'caring for' and 'being cared for' haven't figured too prominently among the entries here. In the main, that's a good sign. It means life has returned to some kind of normal after the traumatic events of 2009. That year, or certainly the first three-quarters of it, revolved around sickness and the effects of impairment – physical, mental and for me especially, emotional. At a few low points in the year, I did feel as if that would be what the rest of our life would be about – certainly, the rest of our life together. And while I'm being honest, I also admit that once or twice for just a few minutes I thought it would have been better for Allen, and certainly for me, if he had died on the operating table or soon afterwards. But except for one terrible day toward the end of Allen's hospitalisation, those gloomy thoughts never hung around for a whole day. And mainly I refused to believe the outcome would be anything but this: I would get Allen home, and we would be OK. It was a long time before I dared to define what 'OK' might mean. But our life here would work its magic. Of that I was certain. My work in the past ten years has required frequent uprooting, not permanent uprooting perhaps, but I have many times found myself arriving at a hotel room or short-term apartment, unpacking my suitcase, computer and briefcase and getting ready to hit the deck the next morning as...well, mainly, a problem-solver. Never mind what the problem was, and quite often it bore little resemblance to the contracted terms of reference of my consultancy, I could get in there and fix it. But even though to people who had no knowledge of those environments my aid work in developing countries appeared to be challenging, in fact with only very few exceptions my experiences were rarely earth-shattering or heart-wrenching. Out of the ordinary, perhaps. But pretty workaday nevertheless. Even so, the ability to deal with whatever they throw at you, while living and working in unfamiliar and sometimes inhospitable circumstances, without your usual support networks – all that was probably good training for surviving life-threatening medical events. I also had one other tremendous advantage: a partner who isn't a quitter and, maybe most important of all, who is not so set in his ways that he can't adapt. In the 12 months since Allen was admitted to hospital for his second open-heart surgery (the first, 46 years earlier, having got him to 80, he didn't hesitate one minute when asked if he'd consider doing it again), I have met quite a few carers, most of them women, and the partners they care for. I have heard some inspirational but also several sad stories – of a man who would not agree to give up driving and so continued to endanger his and others' lives every day, of a man who could not bear to relinquish control of the family finances and kept changing and then forgetting bank passwords, of stubborn, proud men who could not bear to relinquish the role of Big Chief and so made their carers' jobs much more difficult. All I had to deal with was a man who, for several months, had terrible bugs eating through his breastbone and heading for the heart, and who couldn't eat, couldn't talk, couldn't breathe without a ventilator, was often delirious and couldn't understand much that anyone but me told him. For me, if not Allen, those three months in hospital and then rehab weren't all that difficult. At least, that's how it seems in hindsight. There were battles I had to fight - and I have written elsewhere in this blog about those and about the peculiar combination of brain-related problems that resulted in some of Allen's medical complications. But now, one year later, I realise that those first months of my new role as 'carer' were were just the introduction to a whole gamut of emotional and physical 'settling in'. True, I was living away from home during that time and that was a wrench, but I had our children every day offering care and support. 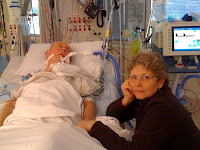 I had a hot meal and cosy bed waiting every night at my daughter's home(unlike the wife of the man in the next ICU bay, who spent months in a motel during her husband's hospitalisation only to have him die on the day he was due to be discharged). I also had daily messages of support from family and friends, some of whom came from China, Sydney, Melbourne and Tasmania to be with us for Allen's 80th birthday celebrations at the hospital. There were even messages from people in Allen's past whom I didn't know. (The email message sticks spread far and wide.) I had almost no responsibilities other than spending seven or eight hours a day at Allen's bedside. And since that was in Intensive Care there was always a dedicated nurse with us, and many of them were a pleasure to get to know. From them I even learned a range of useful bedside skills, becoming proficient enough at some of them to be asked more than once if I had had nursing experience in my past. The daily commute from my daughter's house to the hospital was a drag, but I could listen to books-on-tape and take time to compose myself before ringing the bell every morning for admission to Intensive Care. On the way home in the evening, when I needed it there was time to howl in anguish, and still compose myself before arriving at my daughter's for dinner. And since I refused to believe Allen wouldn't recover, I focused always on the small signs of progress (yesterday 20 minutes of breathing without the respirator, today 40 minutes; today Allen moves from eating only mashed-up food to taking some minced food; today he lifts his left leg 10cm off the bed, and does it while the physio is still there instead of one hour later etc.) And so those weeks slipped by until, miraculously, I arrived one morning to find Allen sitting up, awake and alert, and found out he'd just been wheeled into a proper shower for the first time in two months. It seemed to me then that the home stretch was in sight. 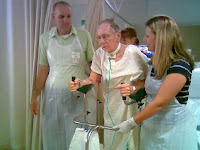 At about Week 8, supported by a walking frame, nurse and attendant, he actually walked a whole circuit of the Intensive Care Unit. By this time we had become such fixtures in the ICU that the eight or nine nurses and other staff on duty that morning all turned to watch his progress and, when he completed the circuit, erupted in a round of applause. After all that attention and what seemed like heroic efforts on Allen's part, being banished to an ordinary hospital room in week 10 and told, 'You'll never take your husband home, so get busy and find a high-care place in a nursing home" was a terrible wrench (the one truly awful day I referred to above)! Thankfully, with our surgeon's help we proved that wrong. 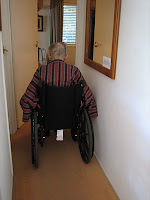 And after two more weeks in a rehabilitation hospital, where Allen's main achievements were that he learned to walk using a conventional small frame on wheels and he began to shake off the effects of the cocktail of anti-depressant and anti-psychotic drugs he'd been given while in Intensive Care, we finally made it home. And that was where my carer odyssey really began. Most of us have heard about the seven stages of grief. Maybe caregiving, when it occupies a large amount of your time and energy and ties you inexorably to being available to one person 24 hours a day, has stages that are not that dissimilar. First comes shock and denial, though in the case of a hospitalisation that should have been over in a week or two, the threat of possible loss went on hovering in the background for three months. I guess I kept denying it, and maybe that was my salvation. Anyway, I had experienced total shock a few years earlier, when my mother had her first stroke and I had to give up all hopes of getting her an Australian visa and accept that I would not be able to be near her in her final years. At that time, too, I remember too well going through the next stage of grieving - pain and guilt - fearing that I might have contributed somehow to my mother's trauma by putting her through the agony of having her visa application rejected. But in this case, with Allen, the guilt I experienced that was harder to shake off was the thought that maybe I had influenced Allen to have this operation, and had not sufficiently researched the risks. Next stage, frustration and anger, typically includes the need to blame someone else for this aftermath. I suppose I directed most of my anger in the first few months at those doctors and administrators who tried to persuade me to give up – to stop the antibiotics, and later, to put Allen into a nursing home. That anger served me well, since it prompted me to defiance. Less useful, though, was the anger I sometimes felt after we got home toward Allen and his neediness. Inevitably, those feelings would take me back to guilt, especially if I got stuck into a bottle of red wine late at night, which was all too easy to do when the house went quiet after Allen went to bed. So it was very easy to slide into the next stage of grieving: depression and loneliness. This was made easier by our relative isolation up here, more than an hour's drive from our children and not within walking distance of any services or shops. Admittedly, we live in a beautiful semi-rural environment, and we're only 20 minutes away from a first-class tourist destination with every shopping and other facility we might want. But especially in Allen's first months at home, taking him out was difficult and eating anywhere but home not an option. And with few old friends living nearby, I was no longer so sure I would manage physically or psychologically. This is when, say the grieving guidebooks, "you finally realize the true magnitude of your loss, and it depresses you". In my worst moments, I felt I had lost two important pegs in my life: my independence and my best friend. Of course, I hadn't actually lost Allen, but I had lost (or so it seemed in those first months at home) much about him that I had come to rely on: intellectual companionship, a ready wit, a keen problem-solving attitude, initiative and enthusiasm in household maintenance, even someone with whom to share the cooking and cleaning, not to mention a shoulder to lean on now and then – in short, a husband. The grief counsellors say that you eventually begin to adjust to life without your dear one – they call this the upward turn. I, however, just had to adjust to a different life with mine. After all, I still had a husband. I just had to get used to the different person he had become. Or rather, I had to learn that my husband was not a different person, even if there had to be some differences in how we lived. I also had to find ways to get back out into the garden, both because I needed to be able to do this if we were to go on living on this large block, and also because I knew the garden would be my best therapy. And since Allen couldn't do many things for himself in those early months and so couldn't be left alone in the house, I had to find a way to keep him safe while I got on with doing things I liked or that had to be done. Mostly, this meant learning to take things slower, not expecting to get everything done in a day and getting more pleasure from simple things. All in all, not a bad lesson to learn at the onset of retirement. It started simply enough with picking mulberries together, which I called Sharing the load when I wrote about it in this blog. But in fact, the load got a lot lighter as a result of my change of attitude. Now, one year after Allen first went into hospital, I think I have finally arrived at the final two stages of grief: reconstruction and working through, and acceptance and hope. Of course, it helps enormously that Allen's physical stamina and general health have improved miraculously in the past six months. He has become something of a pin-up boy to the people who've worked with him. Our return visit to the ICU a few months ago, just to show him off, had doctors and nurses staring in disbelief. His geriatrician marvels that Allen's scores on all the standard psychological tests are almost the same as they were a year ago, even though brain scans show the 'holes' in his brain continue to expand. And from someone whose best efforts at drawing a face toward the end of his hospitalisation just nine months ago resembled those of a three-year-old (see picture on the left), Allen has progressed to writing brief letters to family and friends, he can operate a number of aphasia-specific therapy programs on computer, and he can read just about anything. Indeed, he is back to trawling the shelves on our weekly visits to the library, and recommending books he thinks I might enjoy. We both know but don't dwell on the fact that sometimes Allen can't appreciate the complexity of a complicated plot or argument in a novel or current-affairs program. But it doesn't detract from the pleasure he gets from reading. In fact, one of the first independent things he did while still in the ICU was to pick up a newspaper I'd brought in and hold it up as if to read – upside down! He just needed to feel the comfort of that familiar act, and to believe that one day he would read and write again. As soon as we got home, he asked me to write out the alphabet on a strip of paper, which he kept on his table, practising letter by letter until he could again recognise and print all the letters, albeit in a shaky hand. He can no longer participate orally in lively dinner table discussion with friends and family, but that doesn't stop him enjoying being part of the scene. He can't remember more than a few steps in any sequence of activities and finds it difficult to execute relatively simple tasks that he once did by rote. He has trouble 'reading' a clock to tell time, for example. 'Half past' and 'quarter to' don't seem to make any sense to him, and he can't remember the different roles of the big hand and little hand, so he's as likely to say it's something after 6 when in fact it's 3.30. He knows that is wrong, but can't figure out why. We have both accepted, it seems, that these things don't matter that much – to us, anyway. In fact, the range of things that don't matter to us is pretty astounding. Allen really has no idea at all about money, how much we have to live on, what bills I pay and what accounts I manage. If we're in a shopping centre, I might give him money and send him into a newsagency to buy a paper, where he will decide whether to get The Australian or The Sydney Morning Herald. Those are probably the only commercial transactions he has had in 12 months. Anything more than that would just confuse and upset him. But he is still better than me at selecting the best fruit to buy and making sure we get everything that's on the shopping list. And he can read and understand everything I've written here, even if it takes him a week of difficult effort to write as much as a paragraph himself. We seem to have found "realistic solutions to our life-problems". We are "reconstructing ourselves and our lives and dealing with the reality of our situation: finding a way forward" – all things which the experts say characterise the final stages in grieving, too. People who don't know us that well still express concern for my or our 'fate'. Allen, after all, has a form of dementia! And I am stuck at home caring for him! That's what our situation looks like. We are moved by their anxiety on our behalf, but sometimes also amused. I want to tell them I feel just as bad for them, because they are still out there, part of the rat race. We, on the other hand, live quietly day to day, and do pretty much as we please, when we please. Allen is relearning how to swim. I have taken my sewing machine out again after years on the shelf. OK, the garden isn't quite up to scratch. But we have time to get pleasure from looking at it every day. We laugh an awful lot over Allen's 'category' errors. 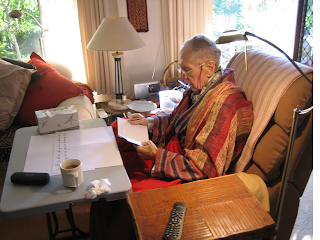 And here am I, doing what I never could find the time to do before caregiving became my way of life: WRITING. I know in many ways we have been very lucky. But my message to carers is this: whenever you possibly can, try to enjoy some of it. What a fabulous post (great writing and great wisdom). Thanks for sharing your journey. As a mother of a son with autism I know a little of what it is like to have your life go in a completely unimagined journey and it has had its rough periods but I wouldn't have it any other way. Ps You are right about the rat race - they are the ones missing out (I wrote a poem about the rat race not long ago). Thanks for your kind words. I did think of your situation when I was writing, having just recently read on your blog about how your son has reacted in unexpected ways to various experiences. 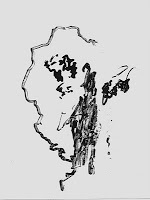 Is the poem you refer to on your blog? Carol, what a wonderful piece of writing. The 'peace' and positivity which just radiate out of it made me feel really proud to have you in my life. I hope there's a forum for these words where other carers may read and be inspired and uplifted by them. Carol, no matter what I write in response to this blog, no words could describe how it made me feel. You write with such honesty and heartfelt sincerity. And the carefully selected photos complement your journey so beautifully. It truly is inspiring. I am sure there are organisations out there that would love to use your journey as an inspiration to others. Now I will sit here and visualise you and Allen and know that everything is ok in your world. How lovely to hear from you, Amanda. So happy to know you're checking in with us now and then. I do hope we'll catch up again in person when your own worklife permits. You'll be pleased to know Allen hasn't lost his sense of humor. This morning he was writing a birthday card to his son Chris in China. Inside the card he put photocopies of him and Chris's mother at their wedding, and wrote underneath: "You were got well, and now you are doing well!" 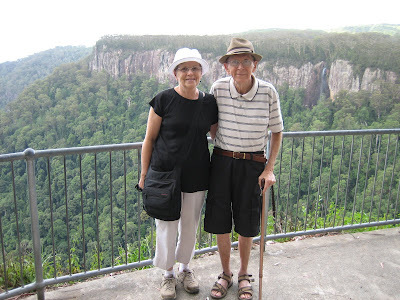 This was a really touching post, and gave great insights into the world of caregiving. Such a big bureden to take on, and I can understand how you could see it to be so unfair, but you have a wonderful attitude and stength. Although, not really on the same vane, I caught a glimpse of what it would be like to take on the burden and responsibility of someone else, who is no longer "quite with it" (sorry that might sound brash). You see my father has Bipolar, and when on his lows and highs, I have to kind of take care of him, and the amount of stress that causes is quite a bit, but thankfully, it only happens in bursts, so I get my freedom...It's been a good few years since I have had to worry. So I so "feel" for what you have to go through, accept you have to do it 24/7. This is a great post! If you don't mind I'd like to post its link in my blog with a short little introduction. By the way, it's a great thing that you find yourself blogging about daily life more than care-giving. That does mean a return to normalcy---as much as people in our situations can. I think that's way I've slowed down on blogging after all these years. Much of the stress that kept me writing is gone. You're also right about having a care recipient not being a quitter being a tremendous advantage. I have one, too, and am thankful every time I run into a story of another caregiver who isn't that fortunate. Aphasia Decoder: Many thanks for your kind words. I am happy for you to add a link to this post in your blog. I note you have four different blogs, so let me know which blog you're posting this in, when you do it. I have taken heart from your writing, and also from the very stylish presentation. Best wishes.